YouTube/MKBHDHow the iPhone 8 might look, next to an older iPhone. The big new feature of the iPhone 8 will be its screen — literally. 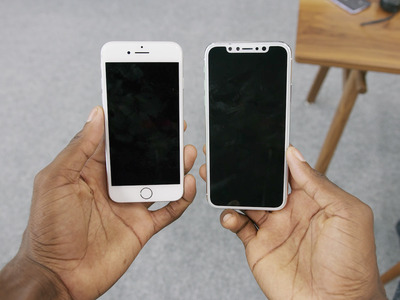 Apple’s upcoming smartphone is believed to have a radical redesign that includes a new OLED screen that reaches almost the very edges of the phone — leaving only the tiniest of bezels. That’s more than twice what it normally pays ($US45 to $US55). In fact, you could buy an entire budget smartphone for that. Concept Creator/YouTubeAn iPhone 8 concept that shows how the top ‘notch’ might look like. So what’s the big deal about these screens? It will be the first time Apple has used OLED displays, and they offer certain advantages over the LCD tech it used in the past. OLED uses less power, offers darker blacks, and responds faster, making the overall picture look better (in theory). The iPhone 8, due to be unveiled on September 12, is expected to be significantly pricier than previous handsets from Apple — potentially as much as $US1,000. 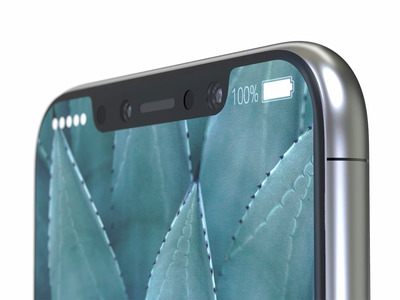 Along with the fancy new screen, that grand will buy you a phone with facial recognition tech, a revamped camera that incorporates augmented reality, a glass back, and (for the time in an iPhone), no physical home button, according to leaks and rumours. That almost edge-to-edge OLED screen comes with a trade-off, however. Apple’s Touch ID fingerprint scanner was always previously part of the home button. With that gone, Apple is believed to have struggled to build Touch ID into the screen itself, and may now be removing the option to unlock your phone with your fingerprint altogether. Apple is also totally dependent on Samsung to make the screen, the KGI Securities analyst said. “Apple is in urgent need of finding a second source of OLED,” he wrote — but that won’t happen any time soon. According to a new report from Bloomberg, Apple may need to wait until 2019 or beyond for any major alternative partnerships. LG’s OLED stock won’t be ready until then at the earliest. The “iPhone 8” may also not be called the “iPhone 8.” There are conflicting reports flying round over what Apple plans to name it, with some suggesting it might be the “iPhone Edition,” “iPhone Pro,” or “iPhone X” instead. In less than a week’s time, we’ll finally know the truth.